It’s amazing what you can accomplish in one day’s work! With a good team, beautiful cloudy Vermont skies and some hard work, we managed to install a new metal roof on this timber frame barn addition in ten hours with finish trim. This particular timbered bridge addition was built by another crew, but since they weren’t available to complete the roof, we were asked to do the job. As a lover of all things timber, we couldn’t bear to see this new frame open to the Vermont elements any longer. Our crew of seven left home at 6 am for the two hour drive to eastern VT. Starting with the raw frame at 8 am, we installed 2×4 nailers. Then, we did the necessary finish on the roof trim and added flashing to the existing barn. Next, we screwed metal roofing to the 2×4 nailers. 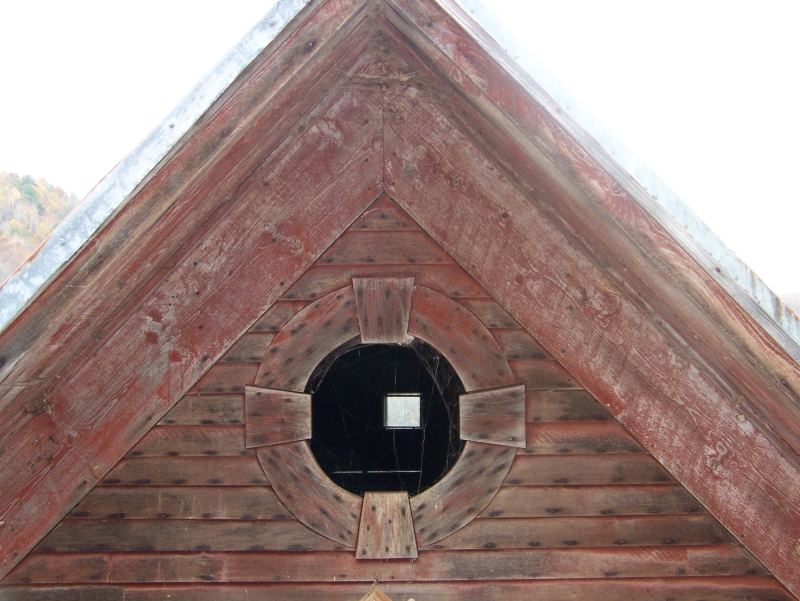 This particular barn has a beautiful gable window that adds an elegance to the building. The original builders did fine work. We believe the barn was built in the 1870s. With the new roof safely and securely in place, the owner is relieved the structure is finally covered. We, too, are pleased that this rugged new timber frame isn’t taking on water anymore. Best of all, it’s a 40-year roof, so none of us will have to come back. I don’t think I’ll be doing roofs into my 11th decade! 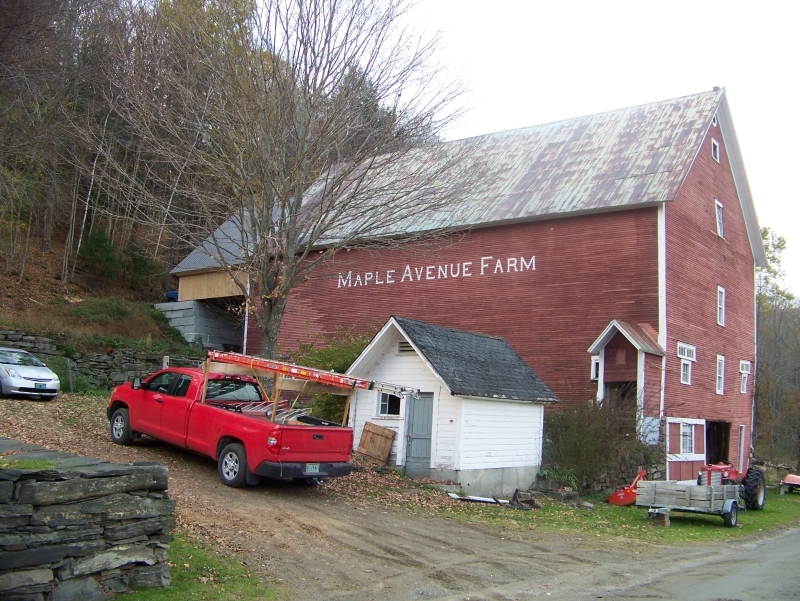 If you drive by Maple Avenue Farm in the back hills of Vermont, you can see the new roof for yourself. There are not many four-story bank barns left in Vermont. Especially with a timber frame bridge to access the upper levels of this 1870s former dairy barn. Meanwhile, we’re always happy to take on another project! 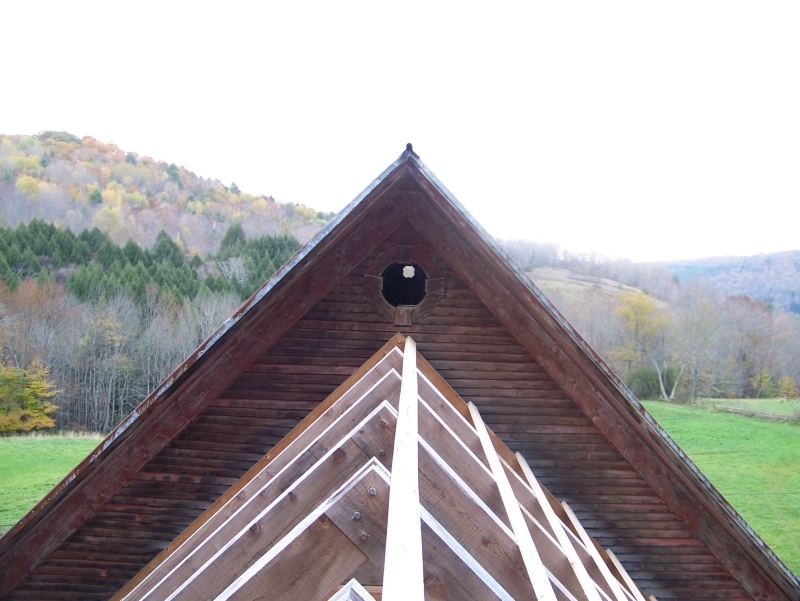 Looking for a timber framer in Vermont? Give us a call at 802.774.8972! This entry was posted in Green Mountain Timber Frames, Post and Beam, Timber Frame Projects and tagged best timber framer vermont, custom barns, custom roofing, historic barn homes, historic timber frames, timber frame roof, timber frame vermont, timber framer, vermont timberframe by Green Mountain Timber Frames. Bookmark the permalink.